Paul Miller shares a joke with his grandson, Max. They play poker together, but as a numbers guy, Miller is hard to beat. 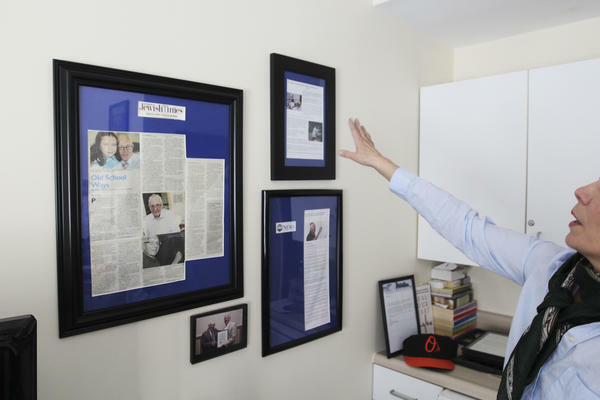 Lisa, Miller's youngest daughter, talks about her father's career as documented through newspaper clippings and photographs on display in his room. 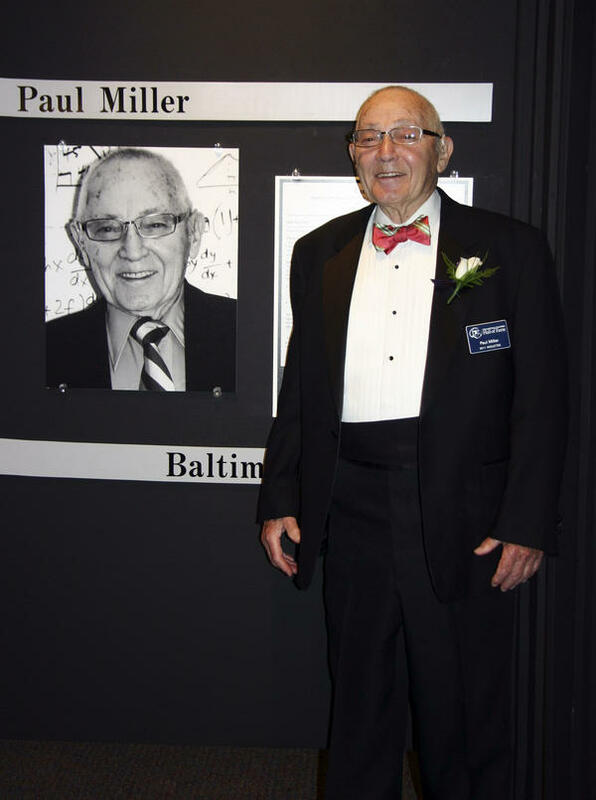 Miller was inducted into the National Teachers Hall of Fame in 2011, an honor he never expected. "If you become a teacher to become famous, forget it," he says. Most teachers these days last no more than five to 10 years in the classroom, but Paul Miller taught math for nearly 80. At one point, he was considered the "oldest active accredited teacher" in the U.S.
His career started in his hometown of Baltimore. It was 1934, the Dust Bowl was wreaking havoc in the Plains, Bonnie and Clyde were gunned down by police in Louisiana, and a thuggish politician named Adolf Hitler became president of Germany. Miller taught elementary school kids by day, college students at night and his mother on weekends. "I had to teach her how to write her name and the address of her house," he says. His parents, Jewish immigrants from Lithuania, had very little schooling. They had arrived in the U.S. long before the Nazis occupied their country in 1941. "My parents spoke Yiddish," says Miller. "They didn't know any English at all." Miller didn't know English very well himself when he started grammar school. But he went on to do well and enrolled in the only college he could afford, a teachers school. It turned out to be a good decision because teaching was one of the few jobs available during the Great Depression. Every dollar Miller made as a teacher he gave to his parents — until he got married. Miller and his wife raised seven children during some pretty tough times. The family struggled on his teacher wages, but Lisa, Miller's youngest child, remembers that as long as her dad was teaching, he was happy. "I don't think he ever considered it work because he loved what he was doing," she says. These days Miller, who has lost most of his hearing, stays in an assisted living facility in Baltimore where his family visits him often. His grandkids, Ilana and Max, call him "Papa." Miller loves playing poker with them, but he is hard to beat. "Until I met Mr. Miller in 1978, I always thought math was boring," says one of his former students, entrepreneur John Shapiro. Shapiro heard we were profiling his all-time favorite teacher and says he had to come by and explain why he liked Mr. Miller so much. "He had a way of making it very easy, very simple," he says. "It worked for me, that's for sure." Miller says he lights up when former students come by to see him, bringing back wonderful memories and reminding him of the impact he has had. The key to teaching math, says Miller, boils down to one thing — repetition. "Repetition is one of the foundations of learning." Repetition and rote memorization aren't exactly cutting edge these days, but it's hard to disagree with the advice Miller gives teachers who are just starting out: "Be sure that you know your subject." You have to wonder though, is that enough? I remind Miller that even talented teachers who know their stuff are leaving the profession in droves these days. So I ask him whether in his 78-year career, there ever was a time he felt like leaving the profession. "Any time you have a bad day you think of that," says Miller. "The next morning, it's all forgotten." Miller chuckles. It's clear he still misses being in the classroom. 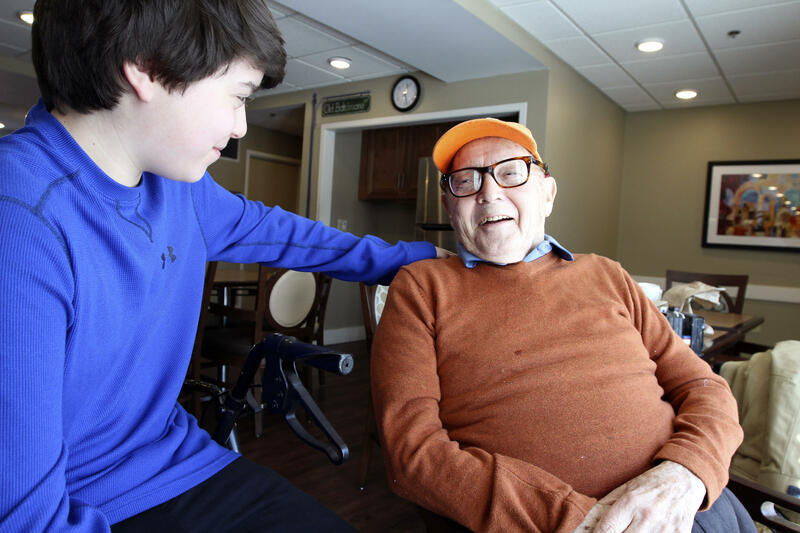 Even a heart attack at age 84 didn't stop him from going back to teaching. Miller continued for 14 more years. By the time he retired in 2014, he had written a college math textbook and become the first Maryland teacher to be inducted into the National Teachers Hall of Fame. It was a long overdue recognition that Miller wasn't sure he deserved and certainly never expected. "If you become a teacher to become famous, forget it," he says laughing. The famous Paul Miller will turn 101 in October. Teaching is a difficult profession. And these days, teachers often don't last more than a few years. NPR's Claudio Sanchez introduces us now to one who spent nearly 80 years in the classroom. CLAUDIO SANCHEZ, BYLINE: Paul Miller loved teaching math so much he wanted to do it forever - and nothing else. His career started in Baltimore, Md., his hometown, in 1934. Back then, the Dust Bowl was wreaking havoc in the Plains states. Bank robbers Bonnie and Clyde were gunned down by police in Louisiana. And that year, Miller started teaching elementary school kids by day, college students at night and his mother on weekends. PAUL MILLER: I had to teach her how to write her name, her address of her house. SANCHEZ: Miller's parents were Jewish immigrants who had left their native Lithuania long before the Nazis occupied their country in 1941. P MILLER: My parents spoke Yiddish and didn't know any English at all. SANCHEZ: Miller didn't know very much English either when he started grammar school. But he went on to do well and enrolled in the only college he could afford a teacher's college, which turned out to be a good decision because teaching was one of the few jobs available during the Depression. Every dime Miller made, he gave to his parents - until he got married. Miller and his wife had seven children during some pretty tough times. The family struggled on a teacher's wages. But Lisa, Miller's youngest child, remembers that as long as her dad was teaching, he was happy. LISA MILLER: I don't think he ever considered it work because he loved what he was doing. SANCHEZ: Miller, these days, lives in an assisted living facility, where his family visits him often. Papa - that's what his grandkids Ilana and Max call him. MAX MILLER: Pop-Pop (ph), you want to play some cards? M MILLER: We're playing poker. SANCHEZ: Miller has lost most of his hearing, so he's hooked up to a gadget that amplifies what people are saying. M MILLER: Wow. You had a straight. You win. P MILLER: Have a straight - where do you see that? SANCHEZ: Miller sits up in his wheelchair, looks at his cards, strokes his chin and smiles. He really lights up, though, when a former student comes by. JOHN SHAPIRO: Hey. How you doing? SHAPIRO: How's it going? How you doing? P MILLER: How you doing? SHAPIRO: You winning? You're not cheating, are you? SANCHEZ: John Shapiro heard NPR was doing a story about Miller, so he wanted to come by and explain why Miller was his all-time favorite teacher. SHAPIRO: Until I met Mr. Miller originally in 1978, I always thought math was boring. And he had a way of making it very easy, very simple. Anyway, it worked for me. That's for sure. P MILLER: The key teaching is just one word, repetition - because it helps you to remember. One of the foundations of learning is repetition. SANCHEZ: Repetition and rote memorization, these days, aren't exactly cutting edge. But it's hard to disagree with the advice that Miller gives teachers who are just starting out. P MILLER: Be sure that you know subject. In your 78-year career, was there ever a time that you felt like leaving the profession? P MILLER: Any time you have a bad day, you think about it. In the morning, it's all forgotten (laughter). SANCHEZ: Miller loved teaching so much even a heart attack at age 84 could not keep him away from the classroom. P MILLER: I tell you the truth, I don't even remember having a heart attack. SANCHEZ: Miller taught 14 more years after that heart attack. By the time he retired in 2014, he had written a college math textbook and become the first Maryland teacher to be inducted into the National Teacher's Hall of Fame. It was recognition that Miller wasn't sure he deserved - or expected. P MILLER: If you become a teacher because you're going to become famous, forget it. SANCHEZ: Paul Miller will turn 101 in October. Claudio Sanchez, NPR News. Transcript provided by NPR, Copyright NPR.